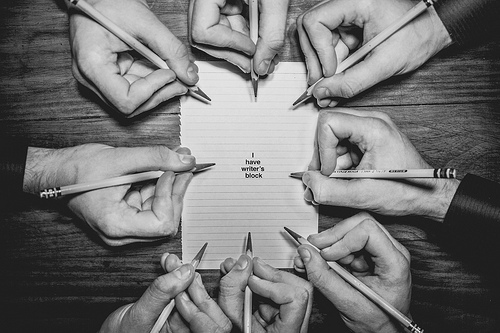 (All words by Kim; photographs by Kim and – where indicated – Matt Kimberley). 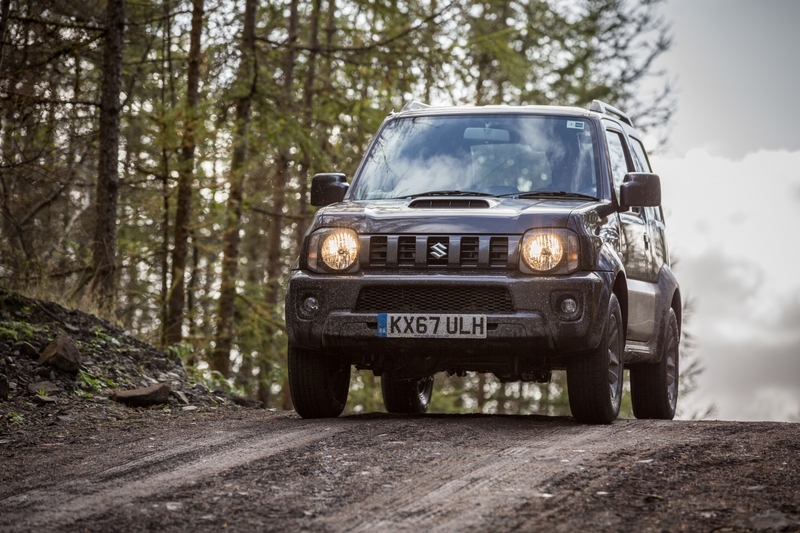 For many decades Suzuki has been associated with producing highly effective and very reliable four wheel drive vehicles, and the trend continues. 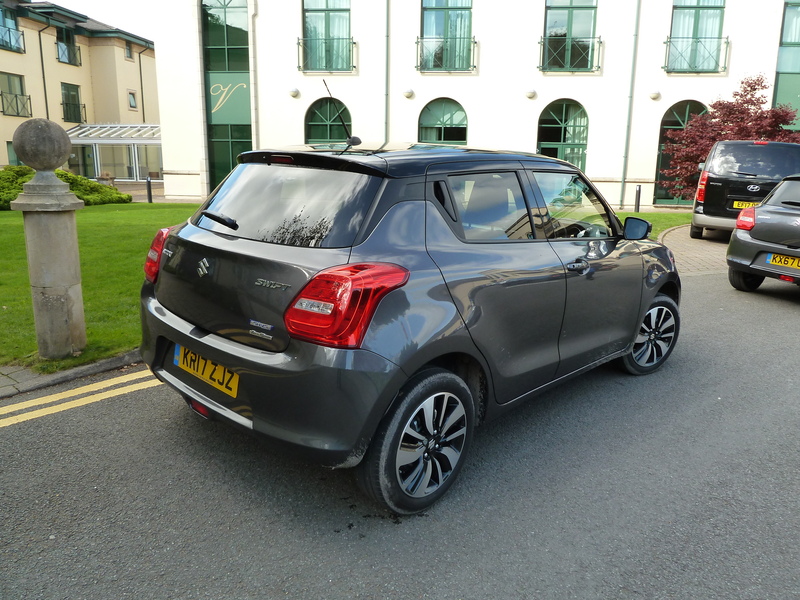 Suzuki has introduced six new models in the last 2.5 years – the Celerio and Vitara in 2015, the Baleno and S-Cross in the following year, and so far in 2017 the Ignis (January) and new Swift (June) have joined the line-up. The Jimny is now the oldest model in the range, but is still attractive to many for its competence and cost-effectiveness, and due to the fact that it has few, if any, direct rivals; approximately 1,000 examples are sold here annually, and owners tend to keep them for seven to eight years. The firm’s cars have been selling in very good numbers too, with 38,167 Suzukis finding UK buyers during 2016, making this the best year ever for the company. The positive growth has continued during this year, and for the first eight months of 2017, Suzuki sales have increased by nine per cent in a market that has, overall, dropped by between two and three per cent. Traditionally, Suzukis have predominantly been sold to private buyers in Britain, but the firm has been taking steps to increase the company’s presence in the fleet market, and as a percentage of the market, sales have doubled from approximately 0.5 per cent to around 1.0 per cent. There is much interest ahead of the European introduction, in the spring of 2018, of the new Swift Sport. While few details have yet been revealed, the car is said to weigh just 970 kg (2,138 lb), and will be powered by a 1.4 litre Boosterjet engine delivering copious quantities of power and torque. The power to weight ratio is said to be an impressive 145 bhp per ton… Can’t wait! The company is a major player in global terms too, with a total of 3.1 million cars sold in 2016 (including 1.35 million in India! ), plus two million motorcycles and 120,000 marine engines. The company has just launched the most powerful outboard motor ever, a compact V6 unit of 4.6 litres capacity and developing 350 HP! To put in context the sales figures for India, in that country some 16,000 Balenos are sold each month (a ‘basic’ Alto is also sold there), compared with 3,000 Balenos for the whole year in the UK! The engine line-up for Suzuki models is bang up to date, including the very efficient 1.0 litre and 1.2 litre Dualjet motors, with twin injectors per cylinder –mounted close to the inlet valves for finer fuel atomisation; these provide especially good fuel consumption and emissions performance (as low as 84 g/km). The turbocharged 1.0 and 1.4 litre Boosterjet motors are also highly efficient, providing good acceleration, smooth-running and excellent figures for emissions and fuel economy. The firm’s SHVS (‘Smart Hybrid Vehicle by Suzuki’) ‘mild hybrid’ system incorporates a belt-driven Integrated Starter Generator (‘ISG’), which works as both a starter motor and generator. The system also features a compact 12 volt lithium-ion battery (located beneath the front passenger seat), to provide assistance to the petrol engine when driving. During deceleration, regenerative braking is employed to re-charge this battery. The set-up, which aids performance, economy and emissions, is deliberately lightweight (adding just 6.2 kg or 13.7 lb to the car’s weight) and relatively inexpensive, thus making it ideal for compact cars. A dash-mounted instrument indicates to the driver the operating state of the system at any given time during a journey. The 1.0 litre Boosterjet (turbocharged) engine and the SHVS system were combined for the first time in the latest Swift models. (Note: For this feature, I shall be concentrating on ALLGRIP versions of the various Suzuki models, but in due course we plan to bring you full road tests including more information on other aspects of the cars). ALLGRIP is the name adopted by Suzuki for its four wheel drive technologies, the details of which (there are three versions) vary according to model. It is interesting to note that the popularity/desirability of four wheel drive across the UK car market has been increasing, with buyers appreciating benefits that include more positive handling on tarmac as well as improved grip and mobility when encountering slippery ground conditions. Between the year 2000 and 2010, typically the take-up of four wheel drive across the UK car market was approximately eight per cent, but between 2010 and 2017 this figure has risen to 16 per cent, with 47 per cent of this figure applying to ‘premium’ or ‘sports’ models. 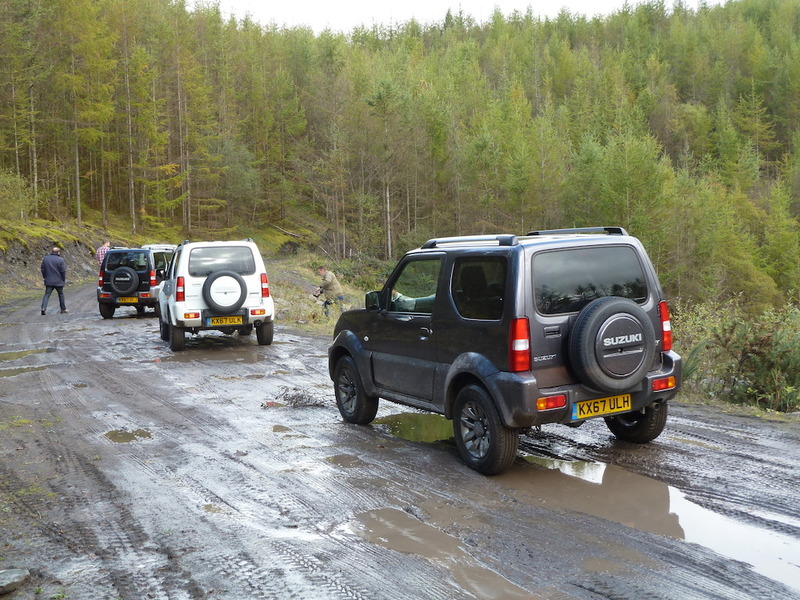 Suzuki models to feature four wheel drive have included the LJ10 (1970), SJ410 (1981), Vitara and Grand Vitara (from 1988) and the Swift (from 2013), as well as the Jimny. These days the only two Suzuki models for which four wheel drive is not available are the Celerio ‘city car’ and the Baleno. For the other five out of Suzuki’s seven models, four wheel drive is now available as standard or as an option. 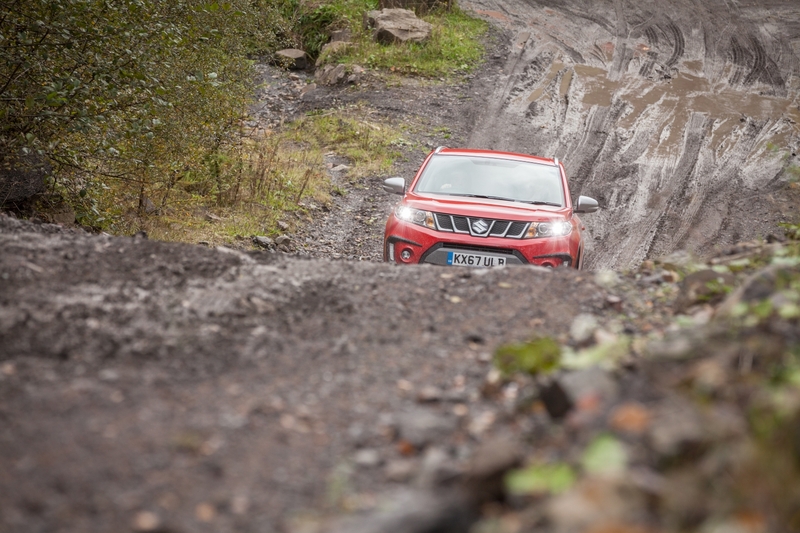 So far this year some 17 per cent of Suzukis sold in Britain were ‘ALLGRIP’ four wheel drive versions, and in the cases of the Vitara and S-Cross, the figure rises to 30 per cent. 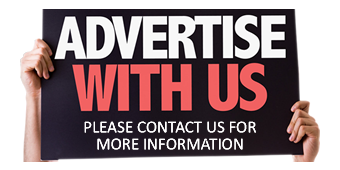 The price differential works out at an additional £1,000 for buyers seeking the reassurance of four wheel drive. 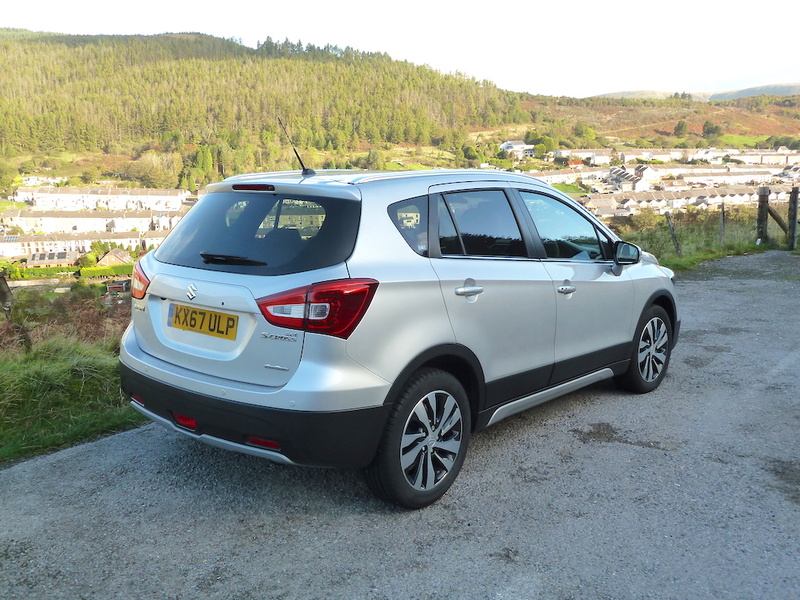 Looking at the overall UK car market, within the top 10 four wheel drive cars costing less than £25,000, and ranked by CO2 emissions, remarkably six of the models – including the top three – are Suzukis. The ‘Auto’ version – as fitted to Ignis and Swift models – does not mean automatic transmission, but refers to a proven, straightforward fully automatic and permanent four wheel drive system that, when required and via a viscous coupling (which effectively acts as a centre differential), transfers additional torque to the rear wheels. This helps maintain mobility for slippery conditions and rough terrain, and aids cornering ability on normal road surfaces. The viscous coupling incorporates two sets of annular (ring-shaped) metal plates that rotate within a casing containing a high viscosity silicon type fluid. In normal road conditions the plates turn at the same rate, but when wheel slippage takes place, the fluid quickly becomes highly viscous when heated by the friction and sheer resulting from the differences in rotational movement of the plates. What happens is that if the vehicle’s front wheels start to spin, the central viscous coupling locks up (due to the friction as described above, increasing the viscosity of the silicon fluid), thus feeding more torque to the rear axle. Hill Descent Control (driver-activated at speeds below about 15 mph in first or second gear) and Grip Control are built-in features of the system. Grip Control is activated by the driver and operates on slippery surfaces at speeds below 18 mph. It concentrates torque on the driven wheels that are finding grip, and rapidly applies braking to a wheel that is spinning. The use of small, lightweight components means that the ALLGRIP system adds only 50 kg (about 100 lb) to the weight of an equivalent two wheel drive model. Buyers of the top specification SZ5 variant of the Ignis compact crossover model can specify ALLGRIP ‘Auto’ (as described above), in conjunction with the 1.2 litre four cylinder 90 PS Dualjet engine. This provides an official Combined fuel consumption figure of 60.1 mpg (probably 55 mpg or so in real life), and CO2 emissions of 106 g/km (compared with 97 g/km for the equivalent two wheel drive model). The mild hybrid SHVS system can also be specified on the SZ5 versions of the Ignis. The luggage capacity of the Ignis is slightly reduced to 204 litres or 7.20 cu.ft (from 260 litres or 9.18 cu.ft for the two wheel drive model), due to the need to accommodate the rear differential. Buyers of the top line SZ5 versions of the Swift can specify ALLGRIP Auto four wheel drive, in conjunction with the 90 PS 1.2 litre four cylinder Dualjet engine, which includes the installation of the SHVS mild hybrid system when specified on the SZ5. This set-up, with 90 PS and 120 Nm (89 lb.ft) of torque (at 4,400 rpm) results in CO2 emissions of just 101 g/km and an official Combined fuel consumption figure of 62.8 mpg. Performance is good too, with a nought to 62 mph acceleration time of 12.8 seconds. It should be noted that as fitted in the Swift, the ALLGRIP Auto system does not include the incorporation of Grip Control and Hill Descent Control functions, as found in the Ignis. The ‘Select’ version of ALLGRIP is installed in four wheel drive versions of the Vitara and S-Cross. It’s an intelligent system that was introduced with the S-Cross in 2013. During development for the Vitara, the system was enhanced by the inclusion of an automatic ‘feed forward’ function that (using inputs from throttle position, steering angle and other factors) transfers torque to the rear wheels before any slippage can take place; this aids stability as well as traction. In the Vitara, ALLGRIP Select is standard on the S, and optional on the SZT and SZ5 versions. 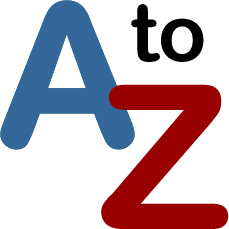 ‘Auto’ is for normal on-road driving, and prioritises fuel economy, running in two wheel drive mode by default, but drive to the rear wheels is also engaged if wheel spin is detected by the system. ‘Sport’ is ideal for twisting roads, making best use of four wheel drive in conjunction with accelerator inputs. At low to mid engine speeds, the system controls the accelerator/torque characteristics to optimise engine response and cornering performance. ‘Snow’ uses four wheel drive by default, to aid grip and progress on snow, or on unpaved or other slippery surfaces. It relies on steering and accelerator inputs to optimise traction and stability in such circumstances. ‘Lock’ mode is for extricating the car from snow, mud or sand. The system incorporates a control device which engages permanent four wheel drive. This mode also helps brake any slipping wheel and transfers torque to the gripping wheels. Hill Hold Control (to stop the vehicle rolling backwards during hill starts) and Hill Descent Control are further standard features. ALLGRIP Select is optionally available for S-Cross models with the 1.0 litre Boosterjet engine, and a standard fitting with the SZ5 versions fitted with either the 1.4 litre Boosterjet petrol engine, or the 1.6 litre DDiS diesel unit. 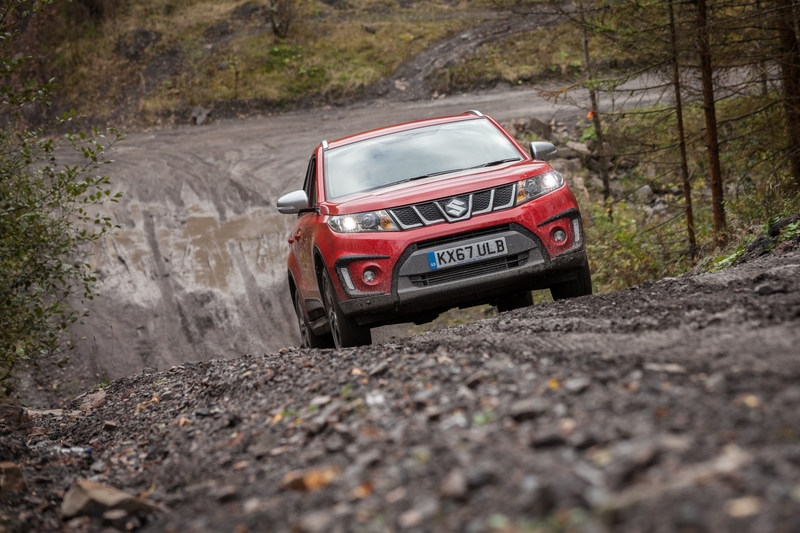 It is controlled by, and operates within, a similar set-up to that just described for the Vitara with ALLGRIP Select, and Hill Hold Control is standard (but not Hill Descent Control). 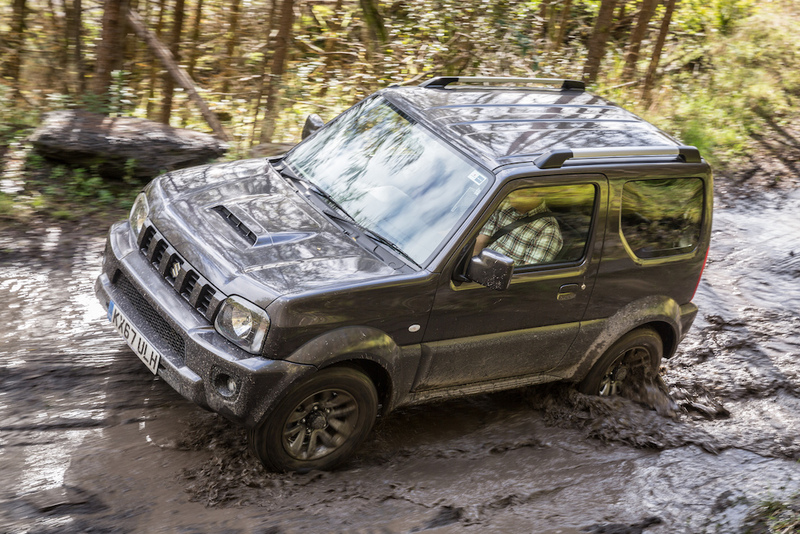 Suzuki’s ‘Pro’ variant of ALLGRIP is reserved for the Jimny – a true off-roader, and the most compact SUV available in the UK. Sales of this iconic Suzuki started in 1998. The ‘Pro’ set-up is a ‘full’ four wheel drive system, controlled by dash-mounted push buttons and incorporating high and low ratios. The four wheel drive system incorporates a transfer box providing high or low ratio (low ratio being reserved for especially difficult ground conditions, steep slippery slopes, etc.). Freewheeling front hubs are automatically engaged, and four wheel drive can be selected on the move at up to 62 mph. Indicative of the design of the Jimny to cope with tough off-road conditions, it features 190mm (7.48 in) ground clearance, a ramp angle of 31 degrees, and approach and departure angles of 34 degrees and 46 degrees respectively. The Jimny is powered by a 1.3 litre four cylinder petrol engine, with variable valve timing, and gives an official Combined fuel consumption figure of 39.8 mpg, and CO2 emissions of 162 g/km with manual transmission. 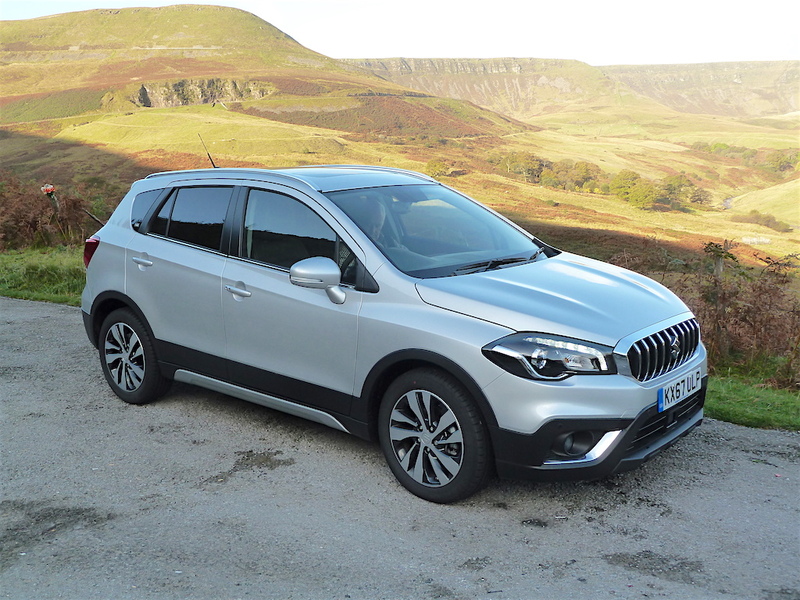 Leaving our event base near Cardiff and heading westwards, my first drive of the day, on tarmac, was in the ALLGRIP ‘Select’ version of the 1.4 Boosterjet powered SX4 S-Cross, which my co-driver and I left in ‘Auto’ mode (intended for on-road driving). The route took in miles of M4, where the S-Cross cruised quietly and smoothly, followed by undulating, twisty roads into the Welsh hills to our off-road test area. My co-driver and I were impressed by the mechanical refinement of this car at all speeds, and with the engine idling it was difficult to tell if the engine was actually running. The same comments applied to the Swift in which we drove back to the base (with many fast miles on the M4), in this case powered by the 90 PS 1.2 litre Dualjet engine, with SVHS and ALLGRIP ‘Auto’ technology built-in. 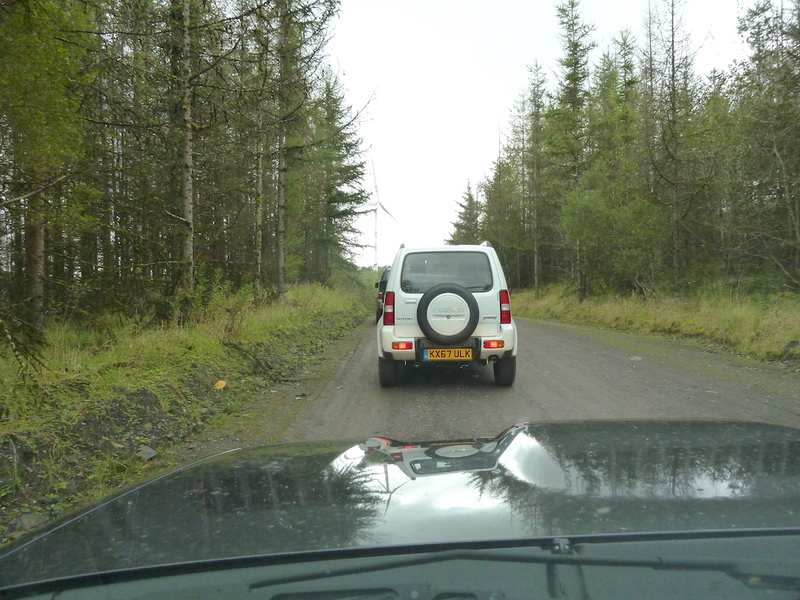 In both cases – and with the Ignis ALLGRIP ‘Auto’ model I had driven briefly (also on tarmac) a week previously – the cars were responsive to drive and felt secure on the twisty roads encountered. 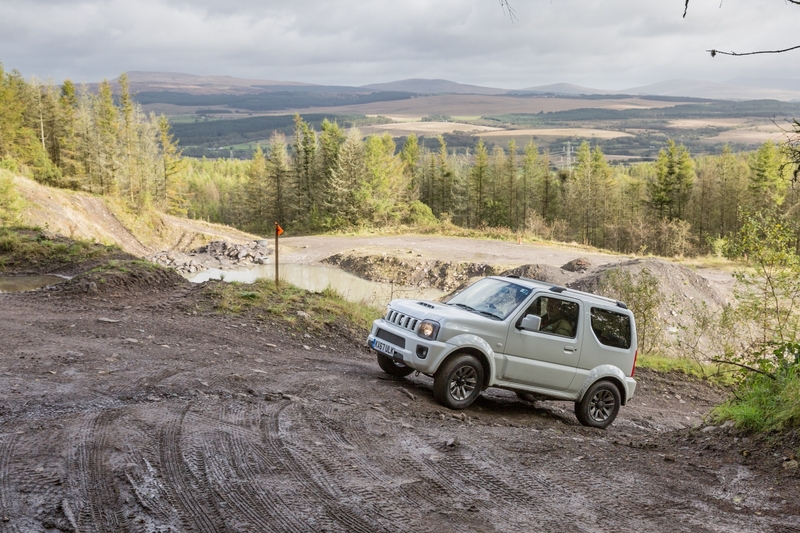 On reaching the off-road test area in the hills, it was then time to drive off on a demanding route in the Jimny with ALLGRIP ‘Pro’ four wheel drive transmission. This took in muddy tracks, steep, slippery boulder-strewn ascents and descents, and a variety of ‘difficult’ surfaces. We started off in normal two wheel drive mode, selecting high ratio four wheel drive as conditions worsened, then low ratio four wheel drive when the going got really tough. Not only did the Jimny take all the rough stuff in its stride, but there was not one creak, rattle or sign of distress from the tough little vehicle, with its strong chassis and well-built bodywork. The 1.3 litre motor provided plenty of torque for pulling across the rev range, and made light of all the steep gradients we encountered. 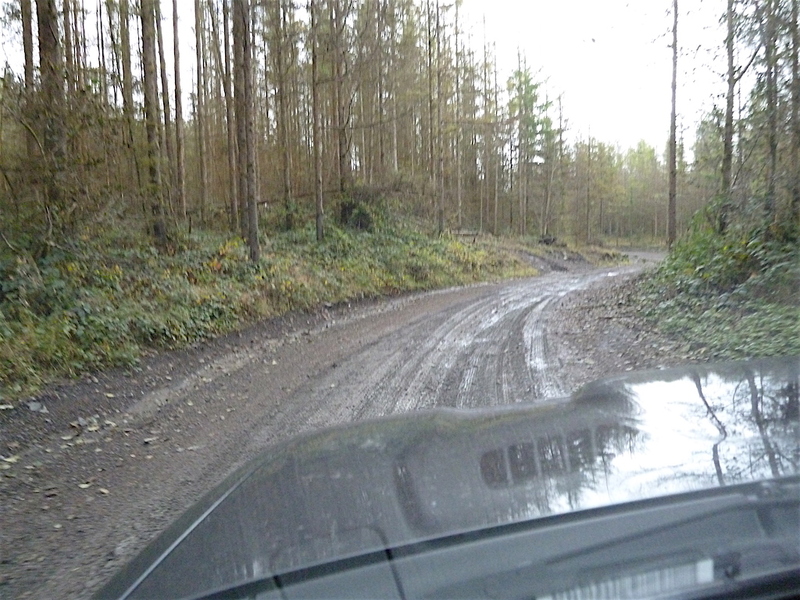 When descending slippery, steep slopes (made worse by recent rain), with low ratio four wheel drive engaged and feet off all the pedals, the car just ambled down the hill, with engine braking keeping speed to a safe minimum. The steering felt positive, even over rocks and mud banks, etc. Yes, I was VERY impressed by this excellent compact vehicle and the hidden abilities that it showed us so well on this demanding route. I have driven many 4×4 vehicles of all types and in all price brackets, and the Jimny felt equal in off-road ability to the best of them. I also found the seats very comfortable, even over rough sections, and liked the pleasant ambience of the roomy interior (especially spacious bearing in mind the compact external dimensions of the vehicle). The Vitara is not intended to be used for full time mud-plugging, and the route set up for my next test vehicle (with the 1.4 litre Boosterjet engine) was understandably not quite as harsh or demanding in nature as the one just completed in the Jimny. However, having said that the route still took us up and down muddy, exceedingly steep tracks, through mud and deep puddles, and along snaking gravel/mud-covered roads in forests. Again the vehicle shook off every obstacle that came its way, climbing eagerly, and easily coping with a particularly nasty-looking gradient, having first engaged ‘Snow’ mode and transmission ‘lock’. When coming back down the same brute of a hill, the Hill Descent Control was engaged and worked superbly, safely controlling the rate at which we came back down to earth. Did I have fun during these drives? (Do I like cars and driving?!). Absolutely; oh yes – sure beats sitting at a word processer for enjoyment! 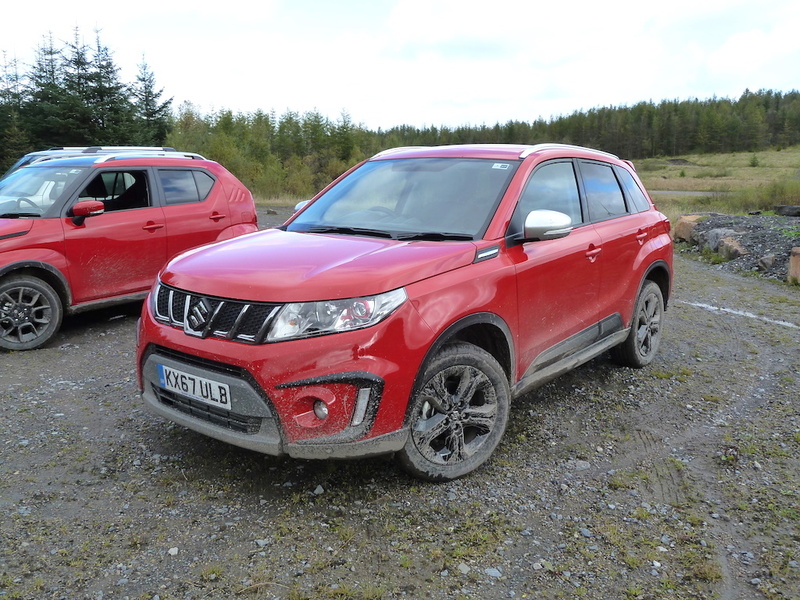 However, the more serious point is that the admirable capabilities of Suzuki’s ALLGRIP four wheel drive systems were comprehensively demonstrated by these test drives in terrain that most people would hesitate at venturing into. Admittedly we were assisted/guided by experts in the four wheel drive field (with extensive experience in all makes/models), but the effectiveness of the vehicles was clear. 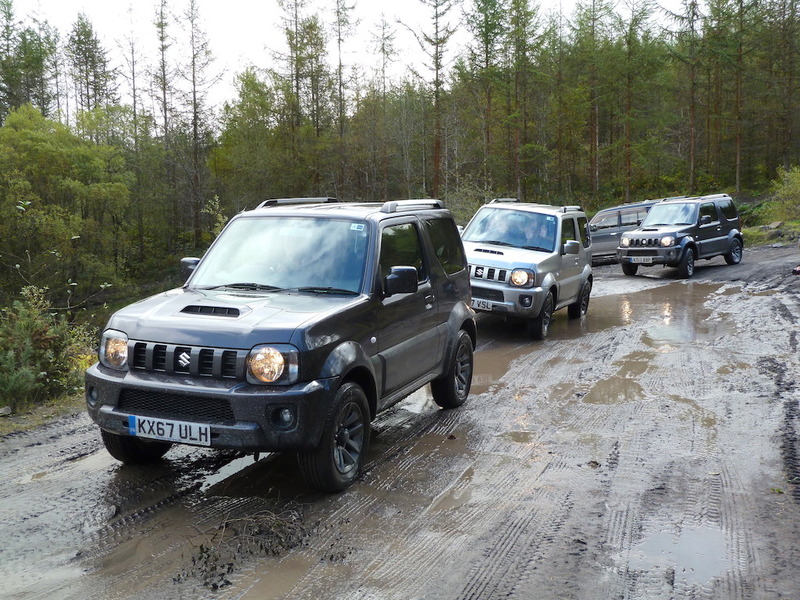 In addition, our hour-long route each way between our base and the off-road venue underlined the fact that these vehicles are also just as capable, smooth running and refined on normal tarmac roads as their two wheel drive counterparts. Yet if surface conditions deteriorate, or in any case on twisting roads, the knowledge that you have four wheel drive available if/when needed is certainly reassuring.